It is a topic that is debated frequently in a variety of prepping and survival forums. 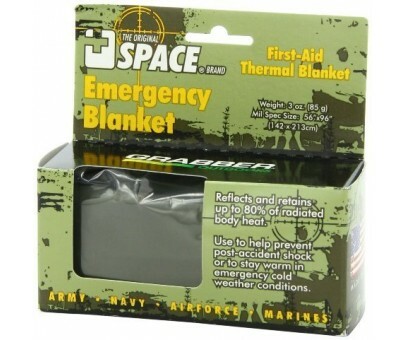 Are space blankets (those cheap tin-foil-like blankets) useful for keeping a person alive in an emergency situation, or do they simply provide a false sense of security? I believe they are very handy in the right circumstance, but the user needs to have appropriate expectations of this piece of survival gear. After all, if these were the greatest thing since sliced bread then everyone in the Arctic would have all their clothes made out of the stuff! That isn’t the case. where you can purchase 12 of them (for the whole family). This is a more durable version that I personally have used as a ground sheet, and as a shelter tarp. They are a bit more expensive, but well worth it in my mind (they don’t pack down as small though). Click here for pricing and more info. They are excellent at reflecting heat, so if you wrap yourself in them, they supposedly will retain up to 80% of your body heat. Alternatively, you may want to use them to provide some sort of reflective shield to direct warmth from a fire onto where you are sleeping. Because they are shiny and colorful, they can be used as a signaling device when needing rescue. They can be taped over the inside of the windows of your home of vehicle to reflect the suns rays / heat AWAY from where you are, keeping you cooler. The opposite is true in the winter when you want to keep heat IN.